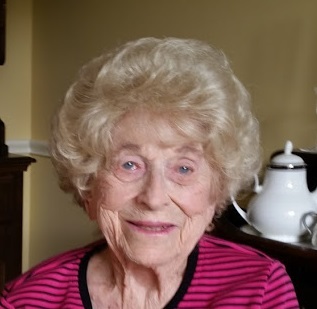 from the Village of Johnson City, passed away peacefully in her sleep on March 26, 2019 at the young age of 98. She was born on March 14, 1921 in Dickson, PA and was the middle child of Joseph and Stella Placek. She was a loving wife, devoted mother, as well as a vibrant grandmother and great grandmother. She spent her early childhood years in Peckville, PA and graduated from Blakely High School in 1939. After graduation, she moved to Johnson City, NY where she met the love of her life Henry “Big Hank” Genthner and was married on May 15, 1943. Together they raised two daughters Cyndy Macarak and Candy Kovey. As an adult she worked at SUNY Binghamton Library, was president of the PTA, belonged to The Order of the Eastern Star, All Saints Episcopal Church and the Episcopal Church Women. She had a passion for gardening, creative cooking, bus trips to Atlantic City to play the slots and vacationing in Wildwood, NJ with her close family. She will always be known for her sparkling blue eyes, affectionate warm smile, famous Christmas cookies, generous loving heart and Golden Girl’s classic good looks. She was predeceased by her father Joseph and mother Stella, husband Hank Genthner; brothers Frank and Stanley Placek; sisters Josephine Placek and Julia Nezelek; son in law Michael Macarak. She is survived by her two daughters Cyndy Macarak; Candy Kovey “husband Bob”; four grandchildren Jon Macarak, Joe Macarak “wife Leslie”, Chris Kovey “wife Karen”, Bobby Kovey “wife Haley” and six great grandchildren Melaina, Addie, Annie, Michael, Jack and June; sister Helen Taylor who will carry on her spirit that’s ‘embodied by the quote she lived by… “It’s always a great life if you don’t weaken”. A Funeral Service will be held on Sunday, at 3:00pm, at All Saints Episcopal Church, 475 Main St, Johnson City. The family will receive friends on Sunday, from 2:00pm until the time of the service at All Saints Episcopal Church. In remembrance, contributions may be sent to All Saints Episcopal Church, 475 Main St, Johnson City, NY 13790.